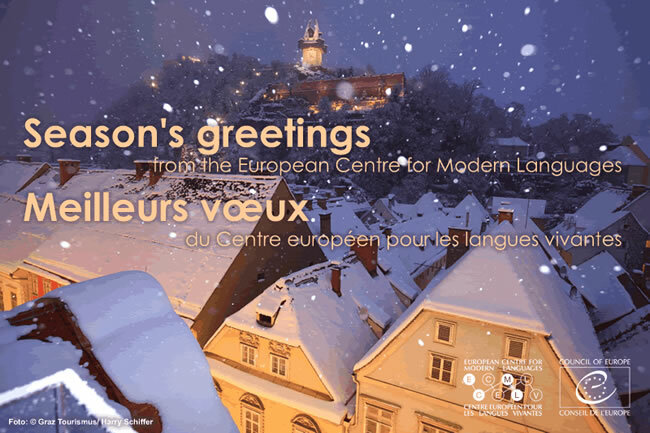 On 10-11 December the ECML presented the results of its current programme 2012-15, “Learning through languages" and launched its new programme 2016-19, “Languages at the heart of learning". Moreover, the ECML celebrated 20 years of successful activity in the field of language education - of anticipating, addressing and adapting to the evolving needs of its 33 Member States and of building and strengthening networks and partnerships at national, European and international level. Participants had the opportunity to gain insight into the current programme outputs and to share ideas and best practice on how to disseminate and implement these rich resources in different educational contexts and countries. They also had a chance to meet the experts who will be delivering ECML Training and Consultancy activities 2016-19, tailored to the needs of individual countries. On this occasion the new ECML programme 2016-19 “Languages at the heart of learning” was officially launched. A panel of experts from different ECML member states gave their perspectives on the ways in which the ECML addresses national challenges at European level. The panel discussion was followed by keynote speeches from senior representatives of the Council of Europe, the European Commission and the University of Graz who considered the vital role of European co-operation in the area of language education to build a better, more socially cohesive Europe. Participants also had the opportunity to visit the ECML Publications Fair. The conference was streamed via the web in order to open up the event to a wider audience. The videos of the individual sessions are now available online. The publications, websites and applications resulting from 14 projects were presented at the "Learning through languages" conference of the ECML. Some examples are a ready-make toolkit and materials for everyone involved in mobility in language education: parents, teacher and teacher educators (from pre-primary to adult vocational), curriculum developers and educational decision-makers. The publications and other results will be further supplemented and finalised versions made available online in the coming weeks. These resources address key issues in contemporary language education such as support for learners from a migrant background, the development of teachers’ digital skills or the need to increase both subject and language depth in CLIL classrooms, to name but a few. The new ECML programme “Languages at the heart of learning” (2016-2019) will address major challenges in language education in member states through three key work strands: Development, Training and Consultancy, and Mediation. At the core of the new programme lies the interrelationship between quality education and quality language education, and the recognition that language is at the root of all learning: all teachers, irrespective of sector or subject area, have a role to play in developing the linguistic and intercultural repertoires of their learners. The main theme of the 2016 ISTP will be “Teachers’ professional learning and growth: Creating the conditions to achieve quality teaching for excellent learning outcomes”. In response to the Call for papers, 97 abstracts have been submitted from which 73 were selected for presentation during the symposium. The programme will be available online in March 2016. Registration will be possible again after 15 January 2015 (limited number of places available). 48th Bi-annual meeting and Conference of the Association of Language Testers in Europe (ALTE) (20-22 April 2016, Stockholm, Sweden). The conference day (22 April) will be open for all those with an interest in language testing and will focus on "Language assessment: purpose and usefulness". The conference is organised by the University of Granada and the European-funded project PETALL (Paneuropean Tasks for Language Learning). Deadline for the submission of proposals: 31 January 2016. The conference aims to promote empowering designs and approaches to language education policy and focuses on the following themes: bi-/multilingual education, classroom contexts, migrants and language education, language education and the working life, second/foreign languages, policy approaches. Call for proposals for presentations until 17 January 2016. The online bibliography of the Swiss Research Centre on Multilingualism (RCM) provides a selection of scholarly publications published since the year 2011 in the disciplines of linguistics, sociology, pedagogy and other fields related to multilingualism.